For me Mudiyet is close to my heart as I grew up in a village in Ernakulam District where annual performance of Mudiyet is an unbroken tradition for centuries. I have witnessed performance of troups other than the one performing here tomorrow. There are differences like length of scenes and the make-up od some of the chracters; but the basics are same. To pin-point the exact period of origin of Mudiyet is next to impossible. In fact it may be a project more in the jurisdiction of an anthropologist than an art lover. I mean the period will be where the demarkation between various branches of social, cultural, spiritual rituals was too faint to distinguish. May be the seeds of this ancient art were sawn when the pre-historic man tried to imitate the dreaded natural forces, in front of the evening camp-fire in his forestside hamlet. The improvements on his "thottam" led to the hymns of dramatic rituals like Mudiyet, several thousand years afterwards. One thing is sure, Mudiyet was there, before Aryan Traditions and big temples came into vogue in Kerala. The fact that the ritual art, or rather the artistic ritual is performed around small Bhadrakali groves supports this assumption. In many cases the arena is just a make-shift amphitheatre around a peepal tree. Another aspect that confirms its ancient origin is the absence of well-defined script, lyrics, and many other elements of classical theatre. In spite of the above said absence of many vital elements of theatre and its ritual character, Mudiyet can be called the oldest existing theatrical form. There is a clear story-line, well defined scenes and characters, a certain amount of dialogue, little bit of singing and dancing, quite a lot of action, delightful variety of "aaharyam" (i.e. make up and costume) and such an bundance of percussion, (melam) the speciality of Kerala. The Aryan and non-Aryan traditions of our mythology is so much amalgamated now, that it is quite impossible to say one from the other. Whether the epics or Mudiyet came into existance first is a subject for the researchers. The central character of the ritual art is Bhadrakali, the most worshipped deity of Kerala. Two of the most fiercest Asuras, Darika and Danavendra had obtained boons from Brahma making them "invincible". They wanted immunity from death at the hands of any male. They got the boon and in addition a curse that a female will kill them; coutesy Brahma who was annoyed by their vanity that no woman can resist their charm. At that time they considered it preposturous and just laughed it off. Indeed the duo grew very powerful and became a threat for the gods and godly men. Vasoorimaala a female associate of theirs added to the misery of the humanity by spreading the horrible disease "Vasoori" (small pox) – then a most incurable and fatal epidemic. After several attempts by the gods to defeat the terrible trio, they decided to perpetrate the Brahma’s curse through a "woman". Indeed, they knew it has to be the ultimate woman power, a combined form of all Devis supported by all the power of the gods. Following the design given by Narada through a "powder picture" Bhadrakali was created by Lord Siva. All the gods donated their special weopons and other battlegear. Through the most fierce battle ever seen, Bhadrakali was successful in her mission. Thus she overcame the bad men and the epidemic. No wonder, Mudiyet, an imitation of that devine adventure became widely considered as a ritual good enough to obtain the goddess’s benevolence against the feared epidemic. In fact there is no clearly defined stage for the performance. Where there is a temple of any sort, the performance takes place facing the deity, straight in front of the temple’s main door, at a convenient distance. The props required are very minimum. A large "ural" (a wooden mortar used to husk and grind grains in those days) served the purpose of stool, raised platform etc. A very large oil lamp combined with torches prepared on-the spot provided the illumination required. Extra effects are created by finely ground pine resin (Thelli) on the burning torch. A large piece of cloth served as curtain with a variety of purposes. Conventionalists use only three items for this purpose. Lamp black in cocoanut oil, rice paste with a touch of lime and vermillion (kumkumam) for black, white and red colours. Of late a touch green is added with Manayola & blue. The make-up has also undergone few changes from being predominently only small pox scars and boils to chutty similar to that of Koodiyattam. 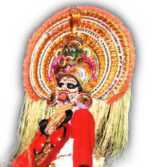 A lot of similarity with koodiyattam is seen in the case of main characters. Which art form imitated which is anybody’s guess. Kali’s headgear is a unique piece of handicraft. A fierce face of the deity and a cobra’s hood are engraved prominently on it. This is the one most important element that gives the character its fierce look. The abundant imitation of hair with finely torn tender cocoanut leaves, Kurutthola and prominent upper eye teeth, small pox boils with a ripe appearance, scarlet eyes, and the shrill screams combine well with the peculiar circular motions to give Bhadrakali the most fearful appearance. Only two characters, Koimpadar and Naradan have costumes similar to those of folk theatre characters. The audience form a vital part of the performance. Participation of the on-lookers is an important aspect. In fact the success of a show depends a lot on the active participation of the audiance. Here I would like to request those of you who have witnessed Mudiyet before to contribute their mite, to cheer the performers and create the ambience. In fact this ambience is the lifeline of a Mudiyet performance. The three most important phases of the performance, the entry of Darikasura, that of Bhadrakali and the fight can become the fiercest best only if the audience in large number cheer them. Artistes Traditionally only members of Kuruppu/Maraar community performs Mudiyet. This is but natural, as these are men who performs two important aspects of Mudiyet. On the ritual side, Kuruthi, Kalamezhutthu etc are their forte. Sopaana sangeetham and percussion concerts are traditionally their profession. Recently men from other Hindu communities are known to be performing both. However, as on date the performers are exclusively male. Kalam Ezhutthu, Paattu and Kuruthy are mandatory before Mudiyet performance. As these are items associated with many other rituals and procedings throughout Kerala, explaination about them, here, is absolutely redundent. The signifiance here is worth mentioning though. Kalamezhutthu is a reminder of how Narada presented a plaucible "design" for the creation of Bhadrakali. Once the form of the deity is created, singing her praise by the person to perform as Kali follows along with other thanthric rituals. He is in fact receiving the deity’s blessings for impersonating her during the performance. Kuruthi is for pleasing the group of various spirits forming the deity’s army, popularly known as bhoothagana. Then there are the artistic rituals known as Kotti Ariyippu and Sandhyakkottu. These are in fact Keli, with a unique style of performance. A rythmn "Kuntanachi" is used. It can be termed a hybrid of the popular Atantha and Champa. Whatever it be, It is very delightful. The actual performance is ushered in with lighting of the stage lamp. Some traditions have it that the village elder or convenor of the festival committee has to perform this ritual. He has to present "Aniyara Daxina" to the artist performing as Kali and accept wicks lighted from the green room lamp. Arangu Keli announces the commnecement. Vandana slokam and hymns are sung. These include a slokam summing up the preface. Scene one is Narada’s plea at Kailas to Lord Siva to save the rightous men and gods from the attrocities of the terrible trio. Here Narada’s part of the dialogue, rather recital, is performed by the artist. Narration and Siva’s replies are done by a percussionist. As the bulk of lyrics is so slender that no specialist singer is used. Lord Siva even does not move his face. The answering guestures are by shaking a bull’s head, kept on the thirasseela. The entry of Darika, known as the Darikan Purappad is the next item. Many consider this part as the most important part of Mudiyet. The rampage is followed by Darika’s announcements facing all directions. Often spectators join in chorus to echoe these shoutings. Then comes the entry of Bhadrakali. The percussion will be at its loudest best here. Rapid "Pandi" or "Muri Atantha" are often the rythm. There may be other variations too. The tempo and length of this scene depends on three factors. (i) Capability of the artist, (ii) quality of percussion and (iii) involvement of the spectators. Often this scene is culminated in the deliberate removal of the headgear, under the presumption that the wrath of the deity has gone beyond control, a popular cliche to justify the abrupt ending of this climax. The much needed rest for the main artist is provided by the scene in lighter vein that follows. Kovilppadanayar, or Koimpatar enters with his peculiar brand of witicisms. Dressed very much like a Patayani artist with steps to match, he engages in a humerous dialogue, with one of the percussionists. It is not unusual for the audiance to echoe some of these, purticularly a passage starting with, "avitecchila chakikalum chila kothakalum. mummuzham chuntikalum muthukatthellikalum ... ..."
Then comes the most popular part. Koolippurappaatu. Kooli is a purattu type character, interacting with the audience. Created in the line of Bheeru of Kathakali, many scholars consider this as the oldest character of its kind in Indian theatre. The dialoge is without a recognized script. The theme is Kooli (one of the bhoothas) going in search of Kali, to accompany her to the battle field. Often this sequence deteriorates to a fund collection spree at the hands of non-proffessional performers. The real purpose of Koyimpatar and Kooli is to have personnel to control the situation. In the days when the battle scene used to be well performed, these characters were much needed. Kootiyaattam (drama) follows. The challenge, counter challenge and the battle. The whole ground may become battleground, scattering the audience at the will of the performers. Abruptly at the peak of the battle scene the Asuras disappear and this sends the deity into uncontrollable anger. Kooli removes the deity’s headgear and Koimpadar with a pretended effort snatches the weapon and appeases her. Some of the troups indulges in rituals like blessing the devotees during the brief interval that follows. But it is definitely better to perform these only in the end. The Asuras reappear after a short while and a dialogue session follows. They engage in a lyrical exchange of words, in the end of which the head gears of Darika and Danavendra are removed to indicate chopping off of the heads. Performance concluded, rituals commence. The deity blesses the entire gathering and the village. Those who desire special blessings of the goddess for their children can have it by paying a daxina. The styles vary. From a gentle touch on the head to a merry go round with the child around the Ural. Finally, by day-break the main artist removes the head gears and waves it in the direction of the devotees and places it for worship.